With infinite choices in creating a portrait, I have made it my mission to portray my subject with truth to nature, beauty in design, and a mood or life force, that is truthful and respectful to my client. My portraits are co-created with the client. My goals are best served by including and welcoming my client to be involved in the planning of their portrait. We begin with discussion of composition, background, lighting, and poses, including gesture and facial expression. I ask the client for their questions, comments, desires, and directions at every meeting including the final finishing details. Some clients choose to be more involved than others. I always keep myself open to the client's wishes. 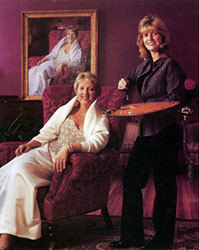 By working this way, my client is pleased with the finished portrait in that their opinions and wishes are fulfilled. 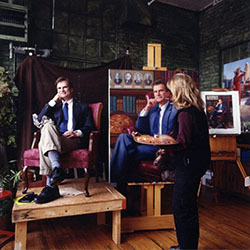 I work within the format and guidelines of each job for size and scope, depending on where the portrait will hang and in order to meet the needs of the buyer. If the buyer is not the subject, I make sure the buyer knows my intention is to portray the subject, respecting the subject's wishes, but within the buyer's guidelines. I will accommodate the client by working with them in their own environment or in my studio. I require a minimum of 5 to 6 meetings with the client, and the number of portrait sittings is generally 2 to 3, but it varies with the client's schedule and needs.